Deutsche Bank is leading the banks and banking indexes lower - as they dropped to a record low amid concerns that mounting legal bills associated with the sub-prime mortgage crisis, commodity (precious metals) trading and large money transfers out of Russia are all complicating the drama and may force the German lender to raise capital. The stock fell by 7% - bringing ytd losses to 53%. CEO John Cryan in an attempt to shore up the firm's capital has cut thousands of jobs leaving the bank at risk.....and the recent DOJ (Dept of Justice) $14 billion judgment against the bank is sparking concerns that they will be forced to raise new capital to cover the costs of the growing legal bills. The question is - CAN they raise that capital? The German gov't has made it clear that they will not 'rescue' the bank in the event of an implosion - think Lehman Brothers. Now to be fair - in the end - no one is assuming that the final bill will be $14 billion - but in today's trading - the bank and the sector are getting slammed. Naturally, DB had no option but to project confidence: "Deutsche Bank is determined to resolve its challenges on its own," the spokesman said. "There is currently no question of a capital increase. We are meeting all regulatory requirements," the spokesman added. Cryan (CEO) and Merkel met in July to discuss Brexit repercussions but did not touch on the matter of potential help with U.S. legal proceedings, a person close to the matter said according to Reuters. That said, the sell side suspects that a new capital raise appears inevitable. Analysts at Mediobanca said that a rights issue looked inevitable. "John Cryan always said that a rights issue would only be triggered by a larger-than expected litigation charge and it appears increasingly likely that Deutsche Bank investors will be asked to post bail for Deutsche's past crimes," they said in note on Monday. If only the market agreed. But perhaps the most sober - and realistic - assessment came from Andreas Utermann, Allianz Global Investors’ chief investment officer, who said on BBG TV that Germany would ultimately help out a struggling Deutsche Bank: "I don’t buy at all what’s coming out of Germany in terms of Germany not wanting to step in ultimately if Deutsche Bank was really in trouble." "Deutsche Bank is “too important for the German economy.” The bank’s tussle with the U.S. Department of Justice over a potential $14 billion legal settlement is “a political issue which will get resolved at a lower price,” he said in an interview with Francine Lacqua and Tom Keene on Monday. The only question is just how will Germany, which has been so staunchly against an Italian bailout of its own insolvent banks, will i) pass such a deal with popular sentiment strongly against more bank bailouts and ii) what will a bailout look like: with €162 billion in debt and only €17 billion in equity, the government check would be substantial. And that, of course, excludes the €42 trillion in gross notional exposure which few if any have been willing to discuss in recent weeks. Massive Derivatives Risk Points to the Bail-In “Nuclear Button” Being Pushed, Maybe. According to the Bank for International Settlements, the total notional value of world derivatives contracts outstanding equaled $550 trillion in 2015. Deutsche Bank reported in its April 29, 2016 earnings announcement that it had notional derivatives exposure of $72.8 trillion, or about 13% of the total global amount. As of June 15, 2016, the total derivatives exposure equates to about 3,600 times the bank's market cap of $20.26 billion. (approx.). Deutsche Bank is unlikely to face losses equal to its notional derivatives exposure set out above, since its contracts are netted out with different counterparties. However, the last financial crisis showed that counterparty risks can snowball and create a chain effect. In 2008, failures at Lehman Brothers and American International Group Inc. led to a run on banks and imperiled the financial system. Similarly, a failure at Deutsche Bank could have catastrophic consequences for the banking system in 2016. (See IMF Chart 1 below). Given the position adopted by the ECB and the German government with regard to bank bail-outs in Cyprus and Greece, it is impossible for them to support a “sovereign” resolution to Deutsche Bank’s capital shortfall. Under the circumstances it would appear that the words “BAIL-IN” are probably going to loom large in the life experience of many German citizens very soon. Potentially hundreds of thousands of Germanic folk, with balances in excess of 100,00 Euro, are going to have their accounts frozen, subject to a review of the bank’s financial state. Under the new rules adopted by Angela Markel et al, deposit monies belong to banks, not depositors. Thus it would not be unexpected to observe a massive capital flight from Deutsche Bank once the “penny starts to drop”. Such an eventuality will only undermine an already terminally weak Euro, currently so fragile following the recent Brexit vote. 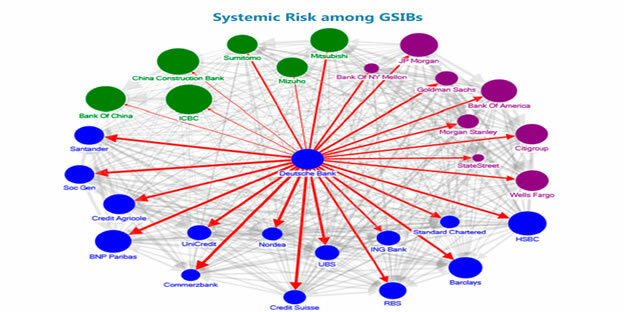 Recently the IMF’s June Report (Ref: 16/189) stated that it regarded Deutsche Bank was a “systemic risk” to world banking (see IMF charts below). This assessment in itself exposes the critical nature of Germany’s problem but for some reason the report was buried in the British referendum media hype. I suspect that this report is going to be dug up over the next few days by the few and will then go viral quickly to the many. 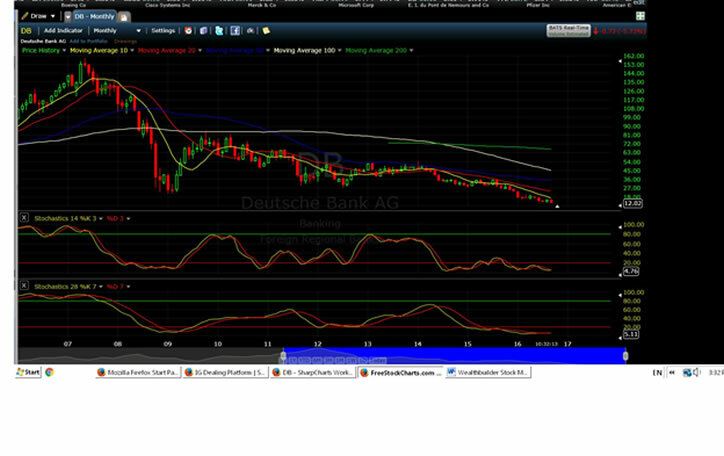 Chart: Deutsche Bank AG: Monthly. IMF Chart 1: Country Report 16/189 June 2016. 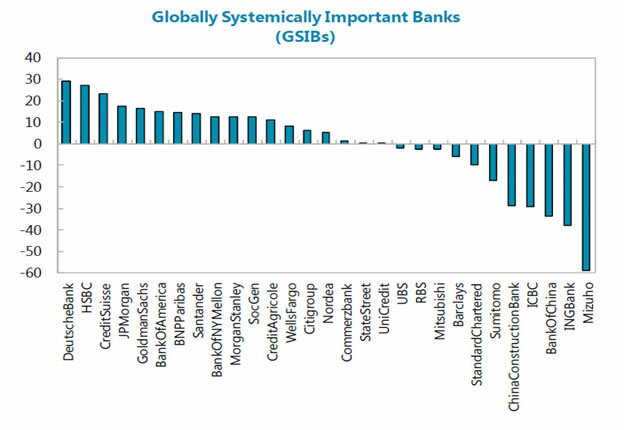 (GSIB: Globally Systemically Important Banks). IMF Chart 2: Country Report 16/189 June 2016. The market has shaken off its FED euphoria. The prospect of a new earnings season is probably beginning to cast a shadow, as is the possibility of a surge in the polls for Donald Trump, following the debate tonight on NBC. For active traders I reckon the upcoming presidential election is going to present the volatility trade of all time. The polls are so close and the policies of each candidate so divergent, the night of the election should be amazing. It could be Brexit all over again. Then, following the election, if Janet Yellen has not yet risen interest rates, imagine the market action around the December and January FED open market meetings. Oh boy, I can’t wait. Thank goodness many European brokers offer 24 hour trading on derivatives these days. Dow Theory wise there is now significant divergence between the Dow Industrials and the Dow Transports. This means market risk is rising and the internal strength of price action is quickly weakening. Therefore the risk/reward ratio is not sufficient to justify large fund placement. 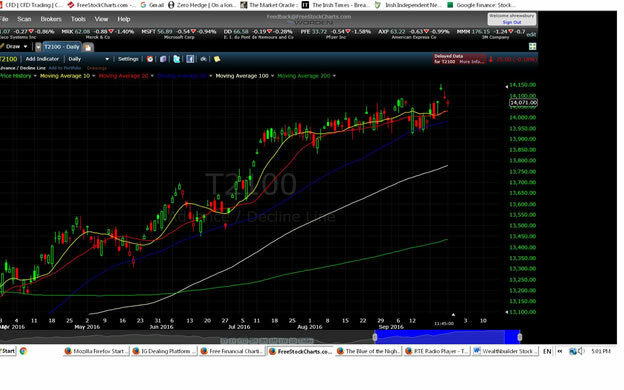 Thus for the moment, investment wise, I would wait and see how things play out this earnings season. A correction would be good. However trading wise I will be very much in place, November 8th, with all guns blazing. Will Donald “Trump” the market I wonder? Kenny Polcari “Morning Thoughts Blog” 26th. September 2016. Zero Hedge, Tyler Durden, 26th. Sept. 2016. IMF Country Report Ref: 16/189, June 2016. Investopia, Lawrence Pines, June 29, 2016.